I’m one of those people that needs their sleep! If I’m running short on sleep you’ll definitely know (kind of like how people get hangry – I get like that if I don’t get a good night sleep). And now that we have our little Isla Rose, every minute of sleep is SO precious. I mentioned on my snapchat a few days ago that we got a new mattress and today I’m excited to tell you all about it! It’s from a company called Leesa, an exclusive online mattress company. They have designed and crafted a mattress that helps people sleep better at night and it’s beautiful (no seriously, you won’t want to put sheets over your mattress). Leesa ships for free and the mattress is delivered right to your front porch, compressed in a box that’s about the size of a mini-fridge (see photo above). When I first saw the box I didn’t believe there was a king size mattress in there! Part of their mission is giving back; for every 10 mattresses they sell, they will donate 1 mattress to families in need. 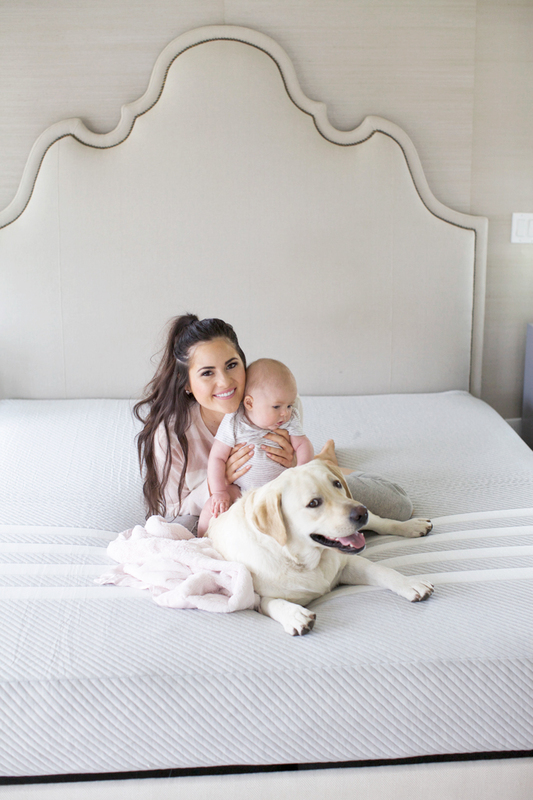 Our entire family has fallen in love with this mattress and it’s already had lots of breaking-in from diaper changes, to cuddles with Dasher and Isla, all the way to TGIT parties with all my sisters piled on the bed. It’s definetly been a great mattress that always give me, Drew, and even Dasher boy the best night sleep. Leesa offers a 100-night sleep trial so if you order it and you aren’t totally in love you can send it back for free. The first 50 readers to redeem the promo code PINKPEONIES at checkout get $75 off their order! 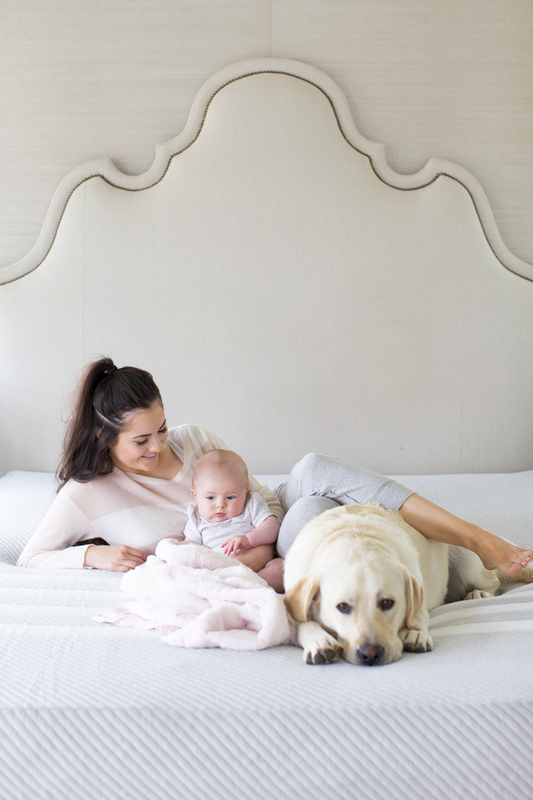 Click here to start shopping for your new dream mattress. Brought to you by Leesa. 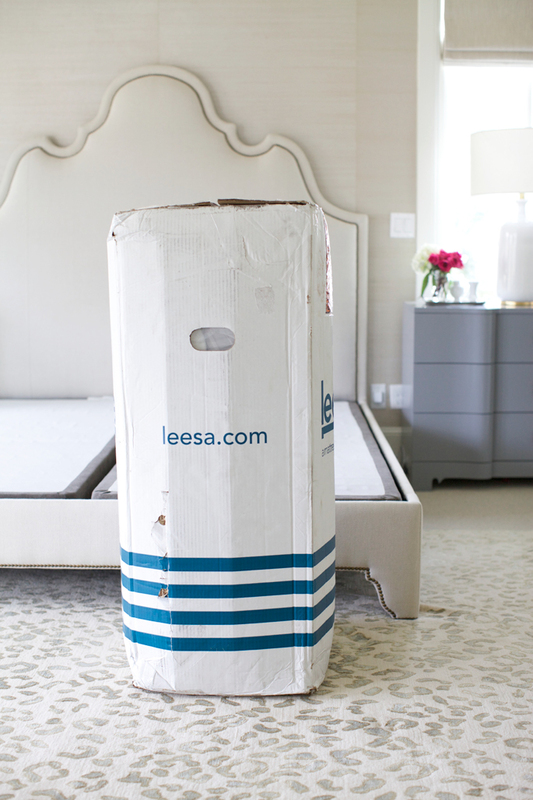 I have been looking to invest in a new mattress so I will definitely check Leesa out! That’s so awesome they offer free shipping too!! I’ve heard about these mattresses in a box. I might have to try one when it’s time to replace our mattress! Super cute photos! The little one is to precious! Oh this sounds amazing! I am all about my sleep!! I’ve heard of them and heard great things! Glad to hear you that you like them too! Definitely something to keep in mind when it’s time to replace my mattress. Love that they give back! Looks comfy! Adorable family pics! Glad to hear that you’re getting a good night’s sleep on it. I saw your pics/snapchat of sheets off your mattress so now that makes sense I guess as you have this. I’m sure whatever you had prior to this if it’s a spring/pocket coil mattress is probably far better. We made the mistake of buying a memory foam mattress (something I’ve never owned before) and it was the wort purchase we’ve made so it’s good to know they offer 100 day returns. After about 2-3 months I realized quickly that although my little one sleeps through the night, I was now not. Our old mattress was old and terrible so anything seemed like it would be better but our new one gives me a max of 5-6 hours sleeping time when I was used to 8-9 hours on a totally different mattress in our guest bedroom. I will never buy a memory foam style mattress ever again-they are way too squishy so you can’t really sit up and read in bed nicely and I’m thin my husband is in shape also and we end up tossing and turning a ton on that mattress because it’s not supportive, you just sink into it. my husband and I are in the market for a new mattress! thanks for the review! 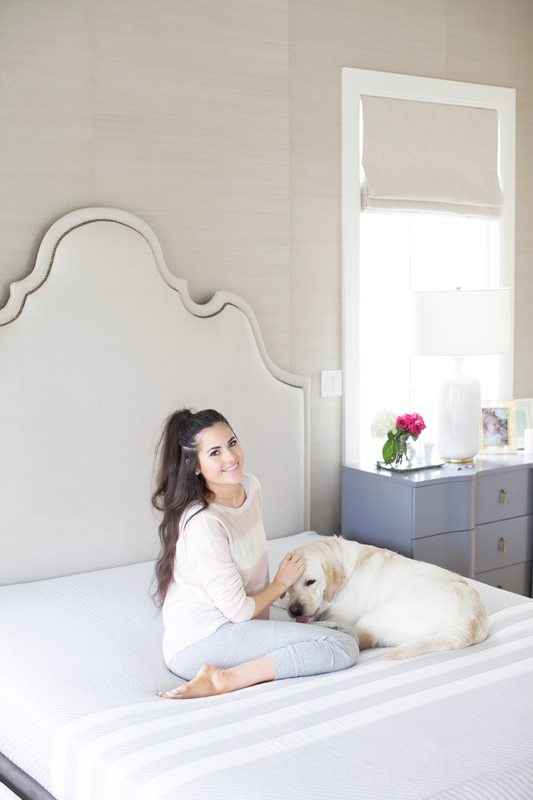 I love your headboard so much…it’s seriously perfect! I was wondering what you had in that giant box at first! I’m a total sleep deprivation monster too. Hope you enjoy your new mattress! That looks like a great mattress! So plush! Adorable photos! 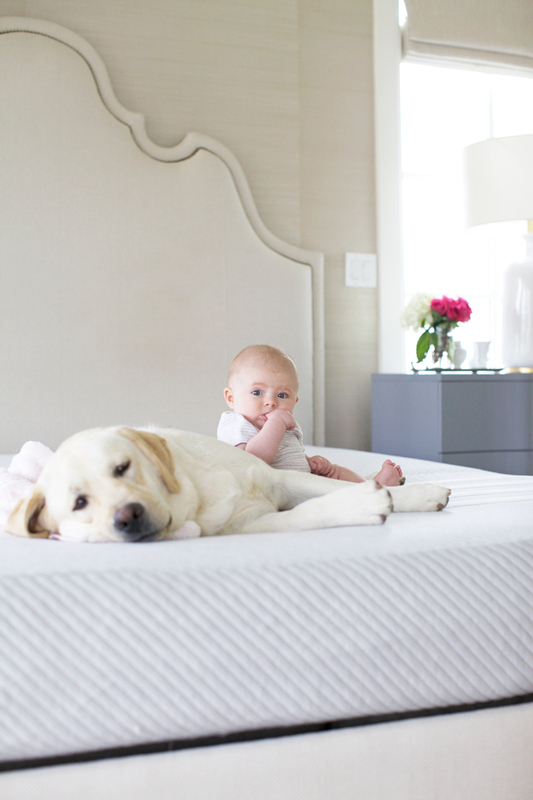 Your baby and dog are so cute! Have a great day! This is so interesting, I never would’ve imagined that could roll out to king size! 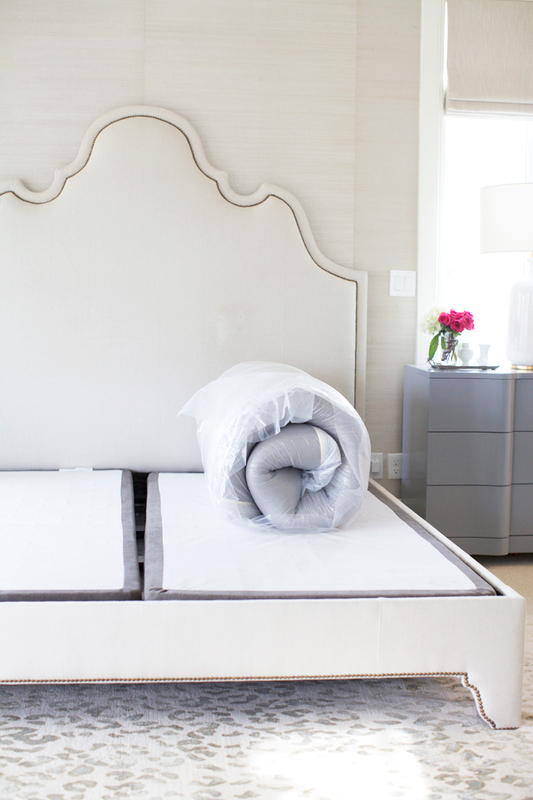 Glad to hear you’re getting your beauty sleep and loving this mattress. I’m hoping to upgrade my bed soon and this is definitely a contender! Wow that looks so comfy!! I need one of those, but it’s out of my price range right now :( Looks great though. How cool is this! I am moving soon and am buying new bedroom furniture and need to try this mattress out! Great post, thanks for sharing, Rach! Can’t believe it came out of that box – amazing! Sleeping is so essential, I am the same exact way! I may need to try this bed! I need my sleep, too. I don’t know how people function off of like 5 hours. This looks really comfy! I definitely love the free try! Love your hair like this! WOW – can’t believe your mattress fit into that box. Amazing! I agree with you 100%, sleep is so important and even more so when you’re a Mama! This sounds amazing! I can’t believe it gets delivered to you in a box! I love your room and I to go I’m big on a good night sleep. After searching high and low I’ve decided to finally bite the bullet and order the bed that you have From Oly Studios, but I wanted to know if you remember and can share the fabric you used? The color is perfect! I would love to know where you got that gorgeous rug! Your picture are amazing You all look lovely! Your daughter is adorable! Love your site! Have a great week-end! I NEED TO TRY THIS MATTRESS! This looks so easy! Hi! LOVE your rug..always notice it when you post pics of your room! Where is it from or something similar?! Thanks! Wow! You wouldn’t think a king size mattress would come out of that box! I will have to try it out, looks very comfy! I love your bedroom by the way! Would you mind sharing the wallpaper info and wall color? I am thinking of doing something like this to my bedroom, hearts! Can you please share where your bed is from please? It’s by Oly Studio, you can purchase it from Alice Lane or Layla Grayce. A good mattress is an important part of your bed indeed. I also have Leesa mattress with a king-sized and I love it! It’s just the right firmness, not too firm and not too soft. Very comfortable. Beside Leesa mattress, I also have another favorite mattress. It is Auping brand from Ruwette shop. I recommend Ruwette for your mattress needs. They have memory foam mattresses and mattresses stuffed with (natural) latex. Check ruwette.nl/auping to see all the collection they have. Hello- Where are your headboard and area rug from? I would love them for my new home! !